Home loans are the most complained about consumer financial product/service, according to a news release from the Consumer Financial Protection Bureau (CFPB). The agency said it received approximately 131,300 consumer complaints since July 21, 2011, with 63,700, or 49% of the total, being mortgage-related issues. Issues related to credit cards accounted for nearly a quarter (23%) of all complaints, followed by bank account issues at 15%, credit reporting concerns at 5%, and student loan problems at 4%. 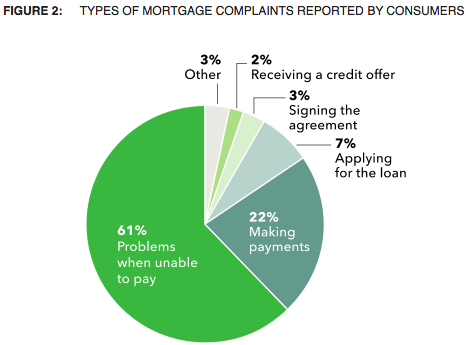 The many mortgage complaints were further broken down by type, with “problems when you are unable to pay” the most common. This category includes issues related to loan modifications, collections, and foreclosure, all prevalent since the mortgage crisis got underway about five years ago. The “making payments” category covers loan servicing, mortgage payments, and escrow accounts. This category also relates to modifications, as consumers expressed confusion regarding trial period payments and whether that would guarantee placement into a permanent loan modification. So if we consider a normal real estate market, about 80% of the complaints could potentially disappear. These two categories deal with the loan originator or mortgage broker involved in the transaction, along with any settlement cost disputes. Just two percent of complaints involved the credit/underwriting decision, and three percent were for “other” issues. Of all mortgage complaints received, about 56,800 (89%) were sent to companies for review and response – the remainder were referred to other regulatory agencies, still pending, or deemed incomplete. And the companies involved have already responded to roughly 53,900 (95%) of them. However, only 1,800 mortgage complaints resulted in “relief,” with the average amount of compensation a paltry $425. So it’s unclear if making a complaint will result in a meaningful result, not that you should be discouraged from pursuing one. Additionally, consumers have disputed about 10,500 (23%) of the company responses to their complaints. Unsurprisingly, Bank of America received the most complaints, according to an analysis of the data from the LA Times. The company services about 15% of all residential home loans in the U.S., but wound up with 30% of the complaints. Most of the complaints were related to loan modifications, collections, and foreclosure, likely thanks to its acquisition of Countrywide Mortgage. Wells Fargo, which handles roughly 30% of the U.S. mortgage market, only received 15.9% of complaints. And Chase, which has 12.7% market share, received 10% of all mortgage complaints. Citibank and US Bank rounded out the top five, though at much lower levels than the top three. If you wish to make a mortgage complaint, heading over to the website is probably the easiest and quickest way. Per the CFPB, the most common route for making a complaint was the website. Roughly half (48%) of all complaints were submitted through the CFPB website, while 32% were referrals from other regulators and agencies, and nine percent were submitted via telephone. You are also able to upload documents related to your complaint, and indicate the type of loan, such as conventional mortgage, FHA loan, reverse mortgage, HELOC, etc. And if you believe the issue involves discrimination, you can also include that in the complaint. From there you’ll be able to track the status of your complaint and receive e-mail updates from the CFPB. They’ll let you know when the offending company responds, and you’ll have a chance to respond to that as well. The complaints you submit will be shared with state and federal law enforcement agencies in order to improve consumer finance laws, write better rules and regulations, and combat business practices that pose risks to consumers. So even if you don’t get anything out of it directly, you can help your fellow consumers by speaking up.